- Vanguard “Big Block” 28, 30, 32 HP twin cylinder 4 stroke engine. Ferris mowers has the most interesting history of any major mower manufacture. The company started in 1909 as the Uebler Milking Machine Company, making quality milking machines for small dairy farmers in upstate New York. Times changed, and by the mid 1980’s the company’s profits were disappearing along with the small dairy farms it served. Not to be deterred, Dave Ferris, one of the descendants of the original founders of the Uebler Milking Machine Company, decided to start making rugged lawn mowers. In 1986, the first hydrostatically driven lawn mower was produced and awarded a patent. Ten years later, the first independent suspension on a riding lawn mower was produced, making history. Calling Ferris owners homeowner machines is really not fair to the competition. Every mower made by Ferris could pass as commercial grade - they are built that well. No corners are cut with these machines, with quality components and construction from the top down. Ferris Mowers are owned by the Simplicity Manufacturing Company, which is a subsidiary of Briggs and Stratton. Snapper and Giant Vac are also owned by Briggs and Stratton. All the Ferris mowers feature the ‘3 in 1’ option,allowing for side discharge, mulch, or rear bagging. The deck cutting height is adjusted manually using a lever, or with a foot control on the more expensive models. The front axles on the Ferris line is pivoting fabricated steel. This is standard on most homeowner ZTR mowers. The drive axles have tapered bearings (similar to wheel bearings on a car) on all models. Ferris is among the few manufacturers to do so. The frames on all the Ferris mowers is fully welded steel ( no bolts and nuts to come loose, compromising the frame strength). Ferris ZTR mowers are available in several models - the 500Z, 1500Z, 1500ZX, 2000Z, 3100Z, 3100ZP, and the 4500Z. All models carry the designation ‘IS’, which indicates ‘Independent Suspension”. No matter which model you choose, you are getting a great mower. Ferris loads these machines with fantastic features ( premium paint, heavy duty wheels, industrial strength wiring) to make this a winning choice. 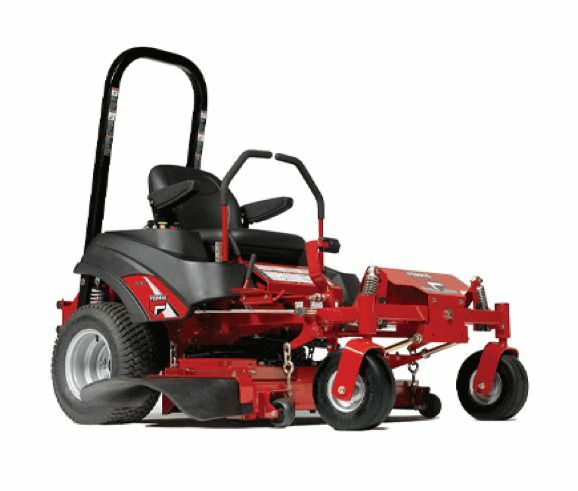 Model 500Z is equipped with either a 24 or 26 HP Briggs and Stratton twin cylinder engine. Cutting width is 44”, 52”, or 61”. The deck is fabricated steel with reinforced side skirts. PTO is electric, and activated with a switch. Hydro-Gear pumps and wheel motors make this mower go, with cooling fans present on the 61” models. The cooling fans not only help the transmission keep cool, the air flow also acts to keep debris away from the transmission. Model 1500Z has a choice between the premium Briggs and Stratton Vanguard twin cylinder engine or the Kawasaki twin cylinder engine. Either is a good choice, ranging from 19, 21, 25, or 28 HP. Want a tough transmission? Try Hydro-Gear pumps and Parker wheel motors for a winning combination. The deck is fabricated steel with reinforced side skirts. Cutting widths vary, and include 44”, 48”, 52”, and 61”. Cutting height is adjusted using a foot pedal. The blades are engaged by using an electric PTO. The roll bar comes standard (of course), making this machine look professional from every angle. The 2000Z offers a great choice of engines. Select between a Kawasaki twin engine rated at 25, 27, or 34 HP; a Vanguard twin (30HP), Kohler twin ( 27 HP), or a liquid cooled Kawasaki twin ( 26 HP). The water cooled engines have a tendency to last a little longer, and run more efficiently. Engines this size need a good transmission. The twin Hydro-Gear pumps and Parker wheel motors get the job done. The lap bars controlling speed and direction padded. Cutting width is either 52” or 61”, and the deck is fabricated steel. Adjusting the deck height is accomplished with a foot pedal. The PTO is electric. Maybe a special driver’s license should be required for model 3100Z. After all, the added power of the Kawasaki twin 26 or 37 HP, Vanguard twin 30 or 32 HP could prove dangerous for the faint of heart. With a cutting width of 61” or 72”, you might be tempted to mow the whole neighborhood! This baby looks fun to drive, with 4-wheel independent suspension, Hydro-Gear pumps and Parker motors, and ‘Hercules’ blade spindles which are designed to last and last. Please try not to put the standard certified roll-over protection system to the test. Its really not fair to call model 5100Z a hmeowner mower. The most pumped of the Ferris mowers, it is powered by a Caterpillar diesel that delivers 33.5 HP, this beauty is at home in any garage next to commercial equipment. The cutting width is either 61” or 72”, and can side or rear discharge. The deck is heavy duty fabricated construction, with a standard 4 wheel suspension. Hercules spindles transfer power to the cutting blades. Like all the other Ferris mowers, drive axles are the 1.25” tapered design. Looking for a top of the line ZTR mower? If cost is not a major factor in your decision, consider Ferris. The quality and performance are superb.